The Reds’ spring training record dropped to 2-10 yesterday with the 2-7 loss to the Diamondbacks. Johnny Cueto was solid in his start, but the offense is busy at the World Baseball Classic. 24 Reds took the field yesterday, and I could only match 9 of those names to faces. Today the Reds head to Tempe Diablo Stadium to take on the Angels at 3:05 p.m. It ought to be quite a show, what with Aroldis Chapman planned to appear and all those sluggers on the Angels’ roster. Glad as I am to have the chance to admire Joey’s calves, we don’t need to be going back to the knee brace. 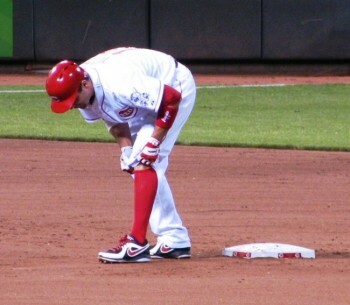 Joey Votto has announced that he will play for the Canadian team in the World Baseball Classic this year. He waited until the very last minute to make the call to test out that surgically repaired knee, but apparently it’s back to Votto-matic-ness because he’s in. Sounds like the team brass was supportive of this decision, and they couldn’t have done anything about it if they weren’t, but if Votto gets injured, we may have no choice but to declare war on Canada. Joey Votto is the only player on the Reds’ 40-man roster who was born in the year 1983. Zack Cozart got the Reds a very short-lived lead in the first. The Cincinnati Reds continued their losing ways yesterday, dropping their 10th Spring Training game to the Arizona Diamondbacks 7-2. Johnny Cueto started and pitched well. Over three innings, he allowed one run on one hit and struck out four. Overall, the pitching wasn’t as bad as the 7-spot makes it look. The defense committed 3 errors, contributing to 4 unearned runs. Manny Parra and Clay Hensley took the brunt of that in their relief appearances, combining to give up 6 runs, only 2 of which were earned. As for the scoring, the Reds took an early lead, thanks to a Zack Cozart solo home run in the first. The offense was largely silent until the seventh, when Henry Rodriguez knocked in a run. The real excitement, though, came before the game began. Dusty Baker and Kirk Gibson, the Diamondbacks manager, had a disagreement about the usage of the designated hitter. Apparently, Gibson wasn’t having any of that. It was National League rules all the way. At the exchange of lineup cards, there were some words between the two managers. Gibson offered to shake hands, but Baker refused. The result? Choo didn’t start and Cesar Izturis was moved to the leaf-off position. Cueto batted in the third inning, but struck out looking because he was forbidden to swing the bat. Such drama for a Spring Training game. Today, the Reds will play the Angels at 3:05pm EST. 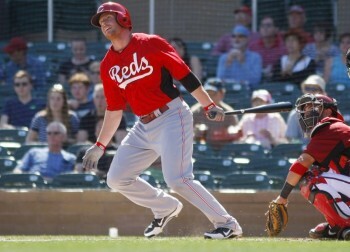 Posted in Cincinnati Reds, Game Wrap, NL Central, Spring Training.